1. Combine sugar, butter, milk in a buttered microwave safe dish, cover. 2. Microwave on high for 8 - 10 minutes, stir every 3 minutes. Cook until mixture forms a soft ball when dropped in cool water. 3. 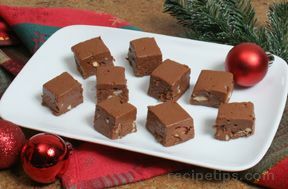 Stir in chocolate morsels until melted, Fold in marshmallow cream, nuts and vanilla. 4. 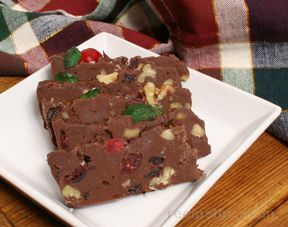 Pour mixture into buttered 9X13 inch pan or glass dish. 5. Place in refrigerator and let cool until set. 6. Cut into one inch squares. Store in air tight container.